Planned route of the new tramline (in french). 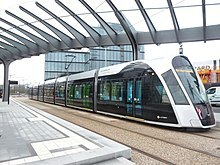 Luxembourg is in the process of reintroducing trams to its transport infrastructure. Construction work begun on a new tram depot on the edge of the Grünewald Forest and the Kirchberg quarter of Luxembourg City in January 2015, with the first tracks being laid in July 2016. The tramline, when fully operational, will have 24 stations connected by 16 km of tracks and have a capacity of 10,000 passengers per hour in each direction. Trams provided by the Spanish company CAF began trials on the first phase of the route in July 2017. Opened on 10 December 2017, the first phase of the route saw trams run from the depot, along Avenue John F. Kennedy, past the European district, the location of many EU institutions, before terminating at the Grand Duchess Charlotte Bridge. Here, a new funicular railway was opened on the same date allowing passengers to descend to Pfaffenthal-Kirchberg railway station for access to national and international heavy rail services running through the Pfaffenthal valley. In operation as of 27 July 2018, the second phase sees tram services extend across the Grand Duchess Charlotte Bridge to Place de l'Étoile in the Limpertsberg quarter. The third phase, to be completed between 2019 and 2020, will see trams extend into the historical Ville Haute quarter, across the Adolphe Bridge and on to Luxembourg railway station for interchanges between national and international heavy rail services, before terminating in Bonnevoie. Work to widen and re-enforce the Adolphe Bridge, first opened in 1903, to accommodate the tramway was completed in July 2017, with a new cycle and pedestrian lane suspended beneath the existing bridge. The fourth and final stage of the route, due to be completed in 2021, will see tram services extend southwestwards from Bonnevoie to Howald, terminating at the new business district in Cloche d'Or. Concurrently, the tramline will also extend eastwards from the tram depot in the Kirchberg district to Senningerberg before terminating at Luxembourg Airport. In June 2018, the Minister for Sustainable Development and Infrastructure, François Bausch, announced that exploratory work had been undertaken for a possible future extension of the tramline along side the A4 motorway to Foetz by 2028, and onto Luxembourg's second most populous city, Esch-sur-Alzette, by 2035. Trams would be expected to reach speeds of up to 100 km/h when traveling through rural sections of the route in a similar fashion to most light rail lines. Twenty-one CAF Urbos trams were delivered in 2017, with a further twelve ordered in 2018. They are 45 m (148 ft) long, 2.65 m (8 ft 8 in) wide, 3.6 m (12 ft) high, with 75 seats and able to carry up to 422 passengers at a top speed of 70 km/h (43 mph). To cope with a 3.6 km (2.2 mi) gap in the 750v DC catenary between "Rout Bréck" tram stop in Kirchberg (about 160 m (520 ft) east of Grand Duchess Charlotte Bridge) and the central railway station, the trams use CAF’s Greentech Freedrive. The last of the first generation of tramways in Luxembourg, seen here in 1964. Luxembourg's first horse-drawn tram line began operations in 1875 running through Luxembourg City along a 10 km line. Electrification followed in 1908. The original track followed a route from Luxembourg railway station through the city centre to Limpertsberg. It was extended to various parts of the city until 1930 when the network covered 31 km. Several lines were closed at the beginning of the 1960s as buses replaced the trams. 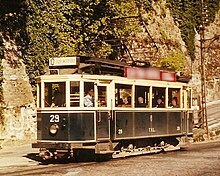 The last tram ran on the line to Beggen on 5 September 1964.The country's other tram network designated Tramways Intercommunaux du Canton d'Esch served Esch-sur-Alzette and its surroundings from 1927 to 1956. A number of historic trams can be seen at Luxembourg City's tram and bus museum located on Rue de Bouillon in Hollerich. In particular, the museum exhibits two electric trams, two tram coaches, and a replica of a horse tram. There are also numerous models and photographs. Association des modélistes ferroviaires de Luxembourg (Walferdange): Les tramways de la ville de Luxembourg: T.V.L., Walferdange : A.M.F.L., 1986, 156p., Collection: Les chemins de fer luxembourgeois, Vol. 5. Bohnert, Paul; Dhur, Raymond; Eck, Jules; Rauen, Prosper: De Minettstram: die Geschichte der interkommunalen Trambahnen im Kanton Esch, Düdelingen : Stadtverwaltung und Kulturkommission, 1985, 325p. Hoffmann Jean-Paul, Dhur Raymond, Clesse René, Balthasar Marcel: Tramway Municipaux - De Stater Tram: die Geschichte des öffentlichen Personen-Nahverkehrs in der Stadt Luxemburg 1875-1993, Administration municipale, 1993, 259p. ^ Hinger, Paul (16 January 2015). "Luxembourg City: Work begins on new tram depot". Wort.lu. Retrieved 4 August 2017. ^ "Kirchberg: Luxembourg City's first tram tracks laid". Wort.lu. 21 July 2016. Retrieved 4 August 2017. ^ "24 stations: Luxembourg's new tramway in figures". Wort.lu. 10 April 2015. Retrieved 4 August 2017. ^ "Delivery in February: Take a first look at Luxembourg's new tram". Wort.lu. 18 January 2017. Retrieved 10 December 2017. ^ "Pfaffentahl-Kirchberg route: Luxembourg's first funicular carriage arrives". Wort.lu. 22 March 2017. Retrieved 4 August 2017. ^ Paulsberg, Linda (5 February 2017). "Chronicle.lu - Linda Paulsberg: the New Funicular Railway - a Railway First in Luxembourg". Retrieved 4 August 2017. ^ "Next Wednesday: Luxembourg trams start running next week in test phase". Wort.lu. 6 July 2017. Retrieved 4 August 2017. ^ Lambert, Frédéric (4 June 2018). "Le tram arrivera place de l Étoile, le 27 juillet". L'essentiel (in French). Retrieved 3 February 2019. ^ Lecorsais, Diane; Tasch, Barbara (28 July 2018). "Three new tram stations". luxtimes.lu. Retrieved 27 January 2019. ^ a b "UNE RÉALISATION PAR ÉTAPES | Luxtram.lu – Un tram pour la Ville de Luxembourg". www.luxtram.lu (in French). Retrieved 4 August 2017. ^ "September 17: Luxembourg City to open cycle bridge in 'world first'". Wort.lu. 18 July 2017. Retrieved 4 August 2017. ^ a b Théry, Patrick (11 June 2018). "Un tram jusqu à 100 km/h entre Esch et la capitale". L'essentiel (in French). Retrieved 3 February 2019. ^ Elsen, Frank (31 January 2019). "Committee for sustainable development: Improving the quality of life and public transport links in Luxembourg". today.rtl.lu. Retrieved 3 February 2019. ^ a b "CAF delivers first Luxembourg tram". Metro Report. DVV Media International Ltd. 10 February 2017. Retrieved 30 March 2019. ^ "CAF Supplies Catenary-Free Trams for New Line in Luxembourg City". Railway News. 7 June 2018. Retrieved 30 March 2019. ^ "Luxembourg tram". caf.net. Retrieved 30 March 2019. ^ "TVL - Tramways de la Ville de Luxembourg (1875-1908-1964)" [Tramways of the City of Luxembourg (1875-1908-1964)]. rail.lu. Retrieved 3 March 2009. ^ "TICE - Tramways Intercommunaux du Canton d'Esch (1927-1956)". rail.lu. Retrieved 3 March 2009. ^ "TVL - Musée des Tramways et de Bus de la Ville de Luxembourg" [Tramways and Bus Museum of the City of Luxembourg]. rail.lu. Retrieved 3 March 2009. The Tünel is a historical underground funicular line in Istanbul, Turkey, located at the northern shore of the Golden Horn. It has two stations, connecting the quarters of Karaköy and Beyoğlu. Its tunnel goes uphill from close to sea level and is about 573 metres long. Inaugurated on January 17, 1875, the Tünel is the second-oldest extant subterranean urban rail line in the world, after the London Underground (1863). It is thus the oldest surviving underground urban rail line in continental Europe, as the older 1862 funicular line in Lyon has been converted into an underground road tunnel. Construcciones y Auxiliar de Ferrocarriles is a Spanish publicly-listed company which manufactures railway vehicles and equipment and buses through its Solaris Bus & Coach subsidiary. It is based in Beasain, Basque Autonomous Community. Equipment manufactured by Grupo CAF includes light rail vehicles, rapid transit trains, railroad cars and locomotives, as well as variable gauge axles that can be fitted on any existing truck or bogie. Europe has an extensive number of tramway networks. Some of these networks have been upgraded to light rail standards, called Stadtbahn in Germany, premetros in Belgium, sneltram in the Netherlands, pt:Elétrico in Portugal and fast trams in some other countries. Trams in Bogotá were first inaugurated on December 24, 1884 with the first tramway pulled by mules, covering the route from Plaza de Bolívar to San Diego, in Bogotá, Colombia. In 1892, a tramline linking Plaza de Bolívar and Estación de la Sabana started operating. The original trams ran over wooden rails but since such tramways easily derailed, steel rails imported from England were later installed. In 1894, a tramcar ran on the Estación de la Sabana to Chapinero line every twenty minutes. Trams in Portugal have generally been traditional electric cars in large cities such as Lisbon, Porto and Sintra. Portuguese tram routes are typically, but not necessarily, tourist attractions.